The Agpro double disc openers are located on a parallelogram system that provides constant down pressure, and they are independent of the weight of your seed drill. What this means is that no matter what the quantity of seed and fertilizer within the drill, the sowing depth remains constant, and in most applications, there is no need for a ground opening device to run before the double disc opener. The parallelograms operate independent of each other, so if one row hits an obstruction, only that particular unit will lift out of the ground, while all other units remain in the ground and the machine will stay steady. Agpro Disc Openers will cut through wheat stubble as high as 8 tonne/Ha. They can also cope with small branches and twigs. Another advantage of the double disc opener over tine seeders is that seeding can be conducted at speeds of between 10 – 16 kilometer’s per hour, and also requiring less horsepower to operate. The spacing of each unit can be as small as six inches (150mm). 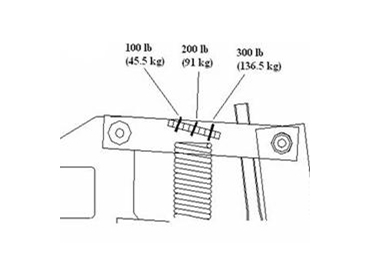 An adjustable spring setting allows down force of 100, 200 or 300 lb to be set, depending on ground conditions. Press wheels are used by the Agpro double disc opener. The press wheel trails behind the disc opener controlling sowing depth and covers the seed and fertilizer with soil, eliminating the need for harrows. A flexible seed firmer gently positions the seed at the bottom of the opening while preventing seed bounce. Other features of the double disc opener include a mud scraper to prevent build up of dirt between the discs and to prevent blockage of the seed tubes, and a press wheel scraper situated behind the press wheel and an easy to use press wheel height adjuster.